In the heart of a private estate of 30 hectares, surrounded by meadows and forests of oaks and chestnuts, the castle of La Roque offers families or groups of friends a moment of rest in an authentic place under a sign of elegance and refinement. Completely restored in full respect of the techniques and traditions of Périgord, the Château de la Roque is a living testimony of history combines authentic architectural features numerous fireplaces, high French ceilings, floors pisés, spiral staircase in an antique furniture decorated in a modern comfort. The vast reception rooms and large kitchen will welcome you for friendly meals in the castle when the hot summer temperatures incite look cool; meals in the garden will be taken under the romantic covered with wisteria arbor or in many small boutique teak garden furniture set around the pool. At the top of a valley overlooking the surrounding plains, without any nuisance or immediate vicinity. the castle welcomes 14 guests on a vast area of ​​450 m2 including 7 bedrooms and 4 bathrooms. - Many garden furniture, opportunity to dine under the pergola, lit park. Great house with a fabulous swimming pool. The owner is extremely helpful and keen to make sure you have a lovely holiday. Only 20 minutes from the airport. Excellent local markets and a supermarket only 10 minutes away. Large grounds and garden. What an incredible property! 14 of us spanning 4 generations had the most magical week at La Roque. Even with such a big family we were lost in the lovely big rooms. The chateau itself is simply stunning, and the grounds are amazing. We didn't even get to explore some of the gardens! Francoise (the owner) could not have been more accommodating, always on email to suggest outings or local points of interest. I only hope we get to one day all return. Thank you very much to you and to all the members of your large family. It is a wonderful satisfaction to see our guests happy in this family house. Thank you for appreciating this beautiful region, its culture, it’s way of life. This is beautiful property that is well maintained by its owner, Françoise, whose kindness and attention to detail were very appreciated. This property is very calm, with no nuisance. The grounds are well kept and Françoise employs a handyman/gardener who is always available should renters need anything. The value is very good for the level of service. Thank you very much Leigh and Marc. Our "old Lady" was happy to welcome you and your two very cute little girls. We hope your shortened stay won't be the last, the Dordogne has still plenty of treasures to discover! From the moment you enter the iron gates of this 300 year old "lady" you will be charmed by her beauty and spoiled by your hosts, Francoise and Denis. When our GPS had us turn down a dirt road just before arriving, we grew weary of what we might find for our party of 13 ranging in age from 9 to 75 years. Not to worry! A one week stay, just wasn't enough. There is much to do here and if you please, you can easily spend day or two do nothing. The home was lovely and spacious, offering plenty of room for the 13 of us to co-habitat very peacefully, never feeling crowded. While there was not air conditioning, the thick stone walls kept us cool even when the temperatures soared in July. The children and adults enjoyed the large pool with many lounge chairs. The outdoor covered table made a great place to play cards or take an afternoon snack. The kitchen and dining room were both big enough to seat the 13 of us together to enjoy our meals. The yard is a great place for the kids to run, roam and play volley ball. Plenty of room for the adults to play petanque as well. Francoise and Denis, the owners, were very helpful in making suggestions as to where to dine, visit or local activities. Jean Marie, the house manager, will delivery fresh pastries to the house each morning for a small fee and is close by to help if you should need anything. We enjoyed two nights of delicious meals prepared by a local cook for a very reasonable price. Arranged through Francoise. So much to do all within driving distance of under 1 hour. Wine tasting, canoeing on the Dordogne, daily markets, horseback riding, etc. We will certainly return and would highly recommend this home to anyone looking for an unforgettable family vacation! Thank you very much Liesl! 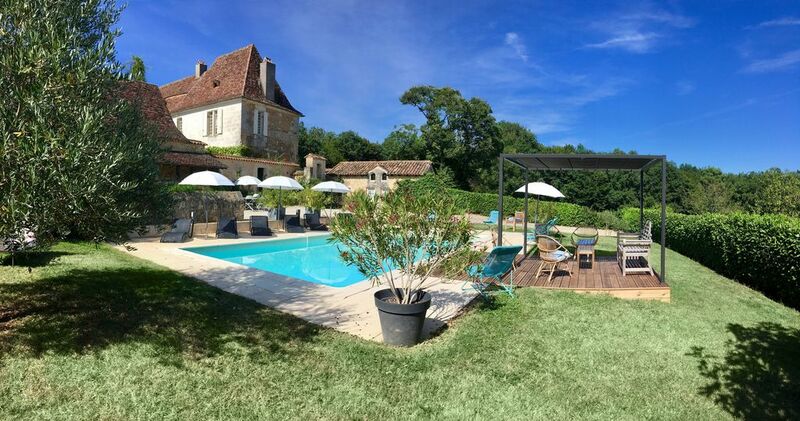 We are so happy that you and your kind family enjoyed your stay in our beautiful Dordogne and in our family chateau. You are right Liesl, this region requires more than one week to be thoroughly discovered with its infinite number of architectural treasures to explore and of activities. Thank you for your joyful presence and your respect for the chateau. The Château de la Roque is located in the immediate vicinity of Bergerac and Perigueux (15 and 25 minutes) two superb biggest cities rebirth Dordogne. Everyone, big or small will find the castle or not far from it, an activity or interest in or not far away. Lazy lovers or children can indulge in the park beside the pool secured 10X5 overlooking the valley; gourmands will cook in the vast and authentic castle kitchen local products purchased in countless local daily markets unless they are introduced to a home chef to the secrets of Perigord culinary preparations; wine lovers taste in the cellars of our vineyards all close our wines of Bergerac, Pécharmant or Monbazillac or prefer to visit the charming Saint Emilion and its prestigious cellars. Athletes are spoiled for choice: mountain biking, walking races and hiking the trails around the castle, horse rides and riding lessons in the many equestrian centers nearby, canoeing on the rivers Dordogne and Vézère, tennis 3 kms to the membership card of the castle, golf at the golf courses of the castle of Vigiers or château of Blackbirds. Massages with essential oils as well as home yoga sessions will be provided by their skilled professionals to provide relaxation and well being. History buffs and stones will rejoice because the exceptional sites such as castles (Beynac, Bridoire, Milandes of Josephine Baker, Lanquais, Castelnaud, Bourdeilles), villages, houses (Issigeac, Beaumont, Monpazier), hamlets surrounding charming Clermont de Beauregard, Montclard, Liorac on Louyre and Romanesque churches are innumerable, unless the sites of Lascaux and Les Eyzies de Tayac do decide to dive in our prehistory. In the evening, the summer season, many villages offer our famous gastronomy Perigord around large tables in their warm hall during the night markets, convivial meeting places. Un dépôt de garantie ou caution de 1500 euros restituable dans un délai maximum de 15 jours après la sortie, déduction faite du coût d'éventuelles remises en état si des dégradations étaient constatées.